Golden Flower at Wynn Macau is nothing short of extravagant. A devoted tea sommelier is one thing (some restaurants have water pairings, after all) but a resident poet who can compose original poems and calligraphy for guests to commemorate their meal? Now that’s certainly stepping it up a few notches. And that’s just one thing that makes Golden Flower distinctive. The Forbes Travel Guide Five-Star restaurant specializes in Tan cuisine, a special and relatively rare blend of southern and northern Chinese flavors created by Tan Zongjun, a government official who hailed from the Cantonese south but went north to work in Beijing during the Qing Dynasty. Chef Liu Guo Zhu and his highly trained team have honed the labor-intensive art (some broths slow-cook for 12 hours) of this kind of cuisine, as well as the authentic flavors of Shandong and Sichuan. Not to be outdone by the kitchen, the actual dining room is a feast for the eyes. Although parasol-shaped lighting fixtures in the main dining room at the Macau restaurant shine down over classic tables and chairs outfitted in pale cream and white, Chinese elements abound with tassels on walls, contemporary screens, and a turquoise wall contrasting with the warm lighting and colors. 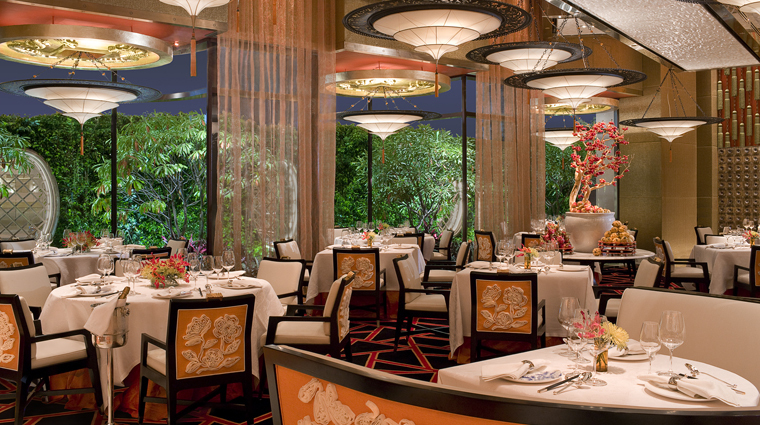 Dining at Golden Flower at Wynn Macau is luxurious yet intimate. Attention to detail can be spotted in everything from the focused service to the creative décor. Golden Flower is the only restaurant in Macau with its own tea sommelier; expert Fiona Wan helps you choose the right tea to go with your palate and she explains the philosophies behind tea drinking as she prepares and pours. The popular Sichuan tea-smoked duck is a must-try dish. After six hours of infusing the duck with tea leaves, the skin of this Sichuan treat ends up beautifully soft, and its flesh deliciously smoky. Though the Forbes Travel Guide Five-Star restaurant is technically located along a busy road, the resort has built a garden as high as the tall windows that line the street-facing wall, which gives the space an intimate, peaceful feel. Given the sumptuous décor at Golden Flower at Wynn Macau, one wouldn't want to under-dress and forego the chance to blend in with the sophisticated surroundings. The official dress code at the restaurant is casual elegant, which means that the casual wear (like a sleeveless shirt and shorts) that some gamblers sport on the casino floor is a no-go here. The cozy, medium-sized restaurant seats a total of 89 people — it offers two private dining rooms with a capacity for 20 while the main dining area is skirted with booths and has three tables (for four people) with window views. For dessert, try one of the most requested dishes — the fried banana and red bean paste wrapped in egg white. For Chinese women, the birds’ nest desserts (double-boiled bird’s nest with coconut milk) are especially popular, as they’re believed to be good for the health and skin.